This Fall we have a few friends expecting babies thus, I'm going to dig into my stash of Eye Spy squares and turn them into a Eye Spy Baby Name Quilt as my May OMG. I'm setting out to have it sewn, quilted and binding complete by this month's end. Comment to let me know if you are interested and if I get enough interest, I'll get the swap organized. I would love to do the Eye Spy Swap! I would love to do the Eye Spy Swap too. I'm interested in another I spy swap. I'm interested inan I-spy block swap. I'm a block swap virgin. This will be my first one! 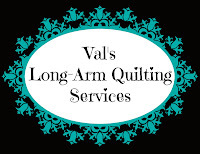 It sounds as if you are going to be one very busy lady, lovely Val! Wow, you've used all those squares? What a great way to get a new stash of them. How fun! Thanks for linking up with Elm Street Quilts One Monthly Goal and good luck with your project! I am interested in your eye spy swap. You know I'm always up for an I Spy swap!!!! Count me in! And good luck with your baby quilt this month! Oh why not. I'm due for a different baby quilt. So, yep, I'll join in.